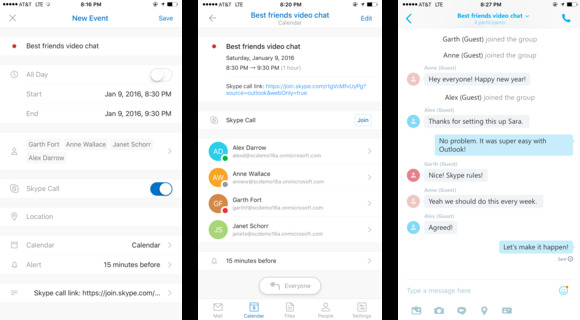 Outlook users who need to cook up a videoconference will have an easier time with new updates Microsoft announced for the app on iOS and Android. The updates, which are rolling out today, let users tap a Skype call toggle inside the app's event creation screen, which will automatically generate a link to a video conference for invitees. When the conference time comes, people who are supposed to participate just need to tap on the Skype link, and the video chat app will open up on their devices. For those people who don't have a Skype app installed, Microsoft's recently released Skype for Web will let them join in on the call, even if they don't have Skype accounts. The improvement isn't all that surprising, given what Google has done with its own calendar invites. When creating an event in Google Calendar, there's a "create video call" button that allows users to spawn a meeting link through Google Hangouts that works in much the same way as the Skype link. The updates come on the heels of Microsoft announcing yesterday that it will be rolling out free video conferencing to all users of the Skype mobile apps. Outlook's calendar view also received a number of improvements, as the product team works to integrate the features of Sunrise Calendar into the app before closing down that dedicated application. Users can now see their full schedule at a glance by scrolling up or down on the two-week view that's in the calendar screen. There's also a new three-day view that lets users see a quick side-by-side look at any three days on the calendar. Android users got a little extra love with this update, which gives them a quick navigation bar at the bottom of the app that lets them quickly navigate among the different mail, contacts, calendar and files tabs inside the app.